Part of the History of Science series by ABDO Publishing, this book explores how forensic science first developed. It covers this history of DNA fingerprinting, autopsy and anthropology, chemistry and toxicology, ballistics, blood spatter analysis, fingerprints, trace evidence, and questioned documents, with emphasis on key scientists and landmark cases. 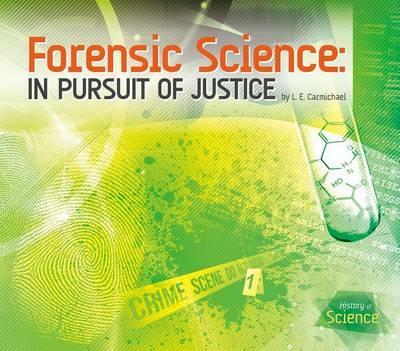 Current issues in forensic science, and the future of the field, are also discussed. For grades 8 and up. I’ve been fascinated by forensics ever since I read the adult true crime novel, The Blooding (Joseph Wambaugh), about the first time DNA fingerprinting was used in a criminal investigation. So naturally, my book begins with the same case – but also covers advances in the field since then! I had more trouble researching this book than any other book I’ve ever written, because so many sources conflicted. Fact checking was painful! Several critical advances in forensic science were developed right here in Canada. The RCMP, for example, manages the world’s largest database of automobile paint samples, critical for investigating accidents and hit-and-runs. "Beginning with an attention-grabbing introduction, the narrative is engaging, immersing readers in the histories of these subjects."